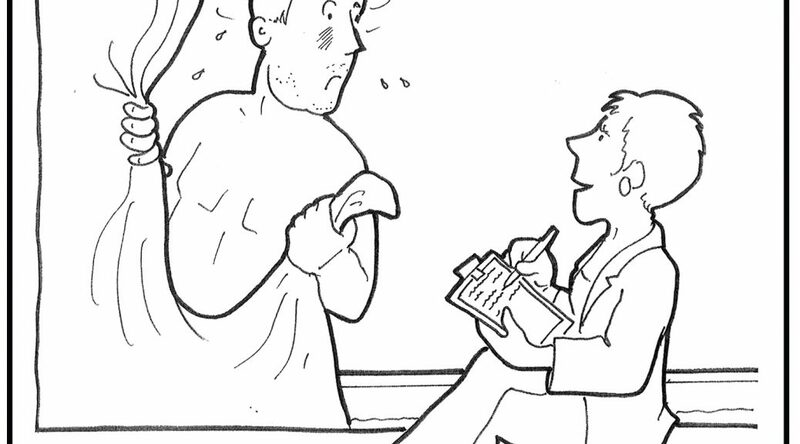 Dawn Childs works with me at The Value Engineers and kindly ‘volunteered’ to do all the illustrations for the book – I only twisted her arm a bit, well she would need her arms if she was to do the drawings. In fact, Dawn has been kind enough to do some illustrations for my previous books, and two from Researchwatching are shown here. It told how Tesco, following a marked drop in melon sales, had commissioned a retail psychologist’s study into the reasons for this decline. The conclusion of that report had been that the modern preference for smaller breasts, as epitomised by the appeal of super-waifs like Kate Moss, was subconsciously leading consumers to reject larger melons. Consequently Tesco has instructed their growers in Spain to produce Galia melons of no more than 0.55kg, rather than the larger 1kg ones that weren’t selling well. At the time a Tesco spokesperson said that initially the retailer had been sceptical but “Since we introduced the smaller melons two months ago we have sold more than a million”. Dawn’s personal story is interesting as well, as she didn’t start out as an illustrator but went to college as a mature student and took an HND in art and design. At the time she had a young family to support and couldn’t afford the time or the money to do a full degree course, however we thought she had potential. That was 23 years ago and she’s still here. When I asked her what her favourite story was in “The prisoner and the penguin”, she chose ‘Daddy’s good luck charm’. It is the moving story of Kevin Bell, six bottles of Coke, friendship and family. “In the 50s we created new ale. Rich, smooth and wonderfully balanced. We just needed a name. There was no twitter back then, but we asked around London for suggestions all the same, and one in particular was inspired. A flower. But not any old flower. ‘London Pride’ (or Saxifraga x urbium to be precise). A tough little perennial that grew during the Blitz, covering the rubble like tiny beacons of hope. 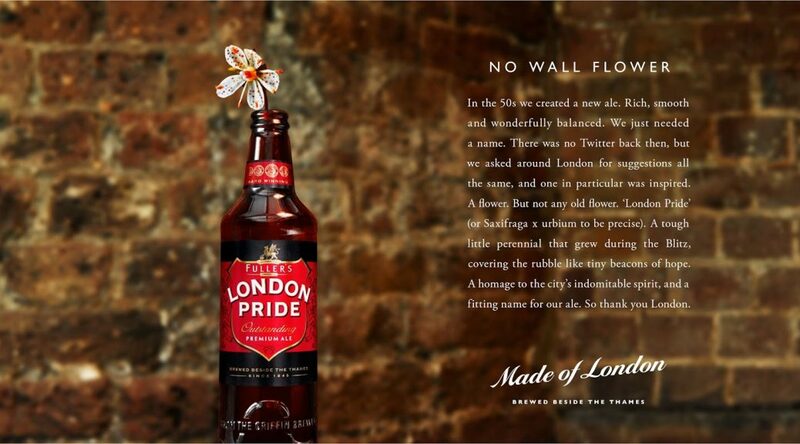 A homage to the city’s indomitable spirit, and a fitting name for our ale. Charlie Robertson was getting worried. His pitch wasn’t going well. He had been through almost the entire Bassett’s portfolio of sweets and his potential client hadn’t seemed interested in a single one. Exasperated, he turned round to get his last few samples, but in doing so he knocked over a whole range of his jars. The storekeeper took one look at the resulting higgledy-piggledy mixture of all the different sorts of liquorice-based sweets and much to Charlie’s surprise and great delight, immediately placed a large order for the mix. 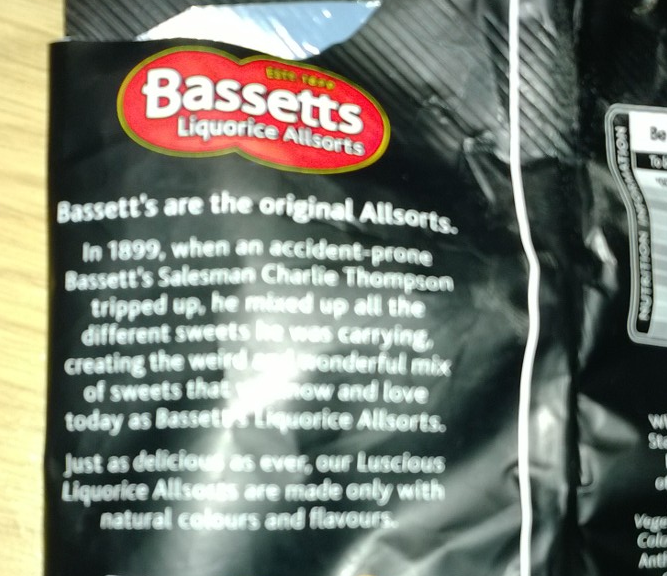 The year was 1899 and Bassett’s Liquorice Allsorts were born. Orders are still pouring in. Round black and rubbery isn’t something you would necessarily associate with food unless you have ever been served burnt squid, but when you add the word Michelin the connection is more obvious. The origins of the now famous Michelin Guide and its star rating system are similar obscure – the connection between fine dining and rubber tyres not immediately obvious. Those origins can be traced back to 1900, a time when there were only a few thousand cars on the road in France. Brothers André and Édouard Michelin were looking for clever new ways to promote the sale of their tyres and decided upon the notion of a travellers’ guide – The Michelin Guide. Their thinking was that if people travelled more they would wear down their tyres and so have to buy new ones. The original guides were given away free of charge, and contained useful information for motorists, including maps, instructions for repairing and changing tyres, and lists of car mechanics, hotels and petrol stations. In 1904 the brothers published a similar guide to Belgium and in subsequent years, guides for other European countries followed. Not surprisingly publication was stopped during the First World War and while printing resumed after the war, the brothers were soon to review their policy of giving them away free. Visiting a tyre merchant on one day, André Michelin saw a pile of copies being used to prop up a workbench and decided that perhaps the old adage of “Man only truly respects what he pays for” was correct after all. The brothers decided to start charging for the guide but they took the opportunity to make some changes to it, listing restaurants and abandoning advertisements in the guide. The popularity and indeed use of the new restaurant section encouraged the brothers to expand it and they recruited a special team of inspectors to visit and review the restaurants. These early Michelin guides were instructed to carefully maintain their anonymity ensuring the independence of the review. In 1926 the guide awarded its first stars for fine dining but initially there was only one tier- either you got a star or you didn’t. A lovely footnote to the story is that during the Second World War publication was again suspended, but in 1944, at the request of the Allied Forces, the 1939 guide to France was specially reprinted for military use: its maps were judged the best and most up-to-date available to the invading armies. Publication of the annual guide then resumed on 16 May 1945, a week after V E Day. In The Prisoner and the Penguin I tell the story of the Dassler brothers, Adolf (Adi) and Rudolph (Rudi), who in the 1920s, worked successfully together to build the Dassler Brothers Sports Shoe Company, operating out, of all places, their mother’s laundry room in the small German town of Herzogenaurach. However during and then after the Second World War tension between the two brothers and their respective wives rose and finally they fell out spectacularly. They went their separate ways to found Adidas (Adi – Das) and, what was originally Ru-Da, and later became Puma. Perhaps though their ways weren’t quite so separate, as both brands were headquartered in the same town, Herzogenaurach. Now I had thought that the idea of two German brothers first building a business together, then splitting and each building a successful new business was likely to be unique. However I have just finished reading ‘Management in 10 words’ by Terry Leahy, long time CEO of Tesco to discover that perhaps lightning can strike twice at least in Germany. In his chapter “Compete” Terry Leahy briefly tells the story of Aldi. Aldi had begun life as a single store in Essen, Germany where it was run by a miner’s wife. In 1946 her two sons, Theo and Karl Albrecht first took over the store and then together rapidly built the business. However in 1960 with about 300 stores now in the chain the two brothers fell out; supposedly about whether or not they should sell cigarettes at the checkout. The brothers couldn’t agree and so split the business into Aldi Nord and Aldi Sud, each brother owning one half. Since then they have kept broadly the same branding and the same business model but operating in different territories …and both have continued to thrive. This idea that lightning can and has struck twice in Germany seems too good to be true so I going to investigate some more and perhaps write it up as a candidate for a volume two. I like to think that I read a fair amount but compared to the rest of my family, I’m lightweight. So a few years ago when my brother, Adam, said “Did you see that article in The New Yorker?” It almost went without saying the answer was “No”. Like me, Adam has worked with brands and marketing; he was a founding partner of the communication agency HHCL, and so he thought one part in the article in particular would appeal to me. It told how slowly over time Terry Waite had won the respect of his guards and how finally one of the guards had offered to try and get him a book. After much thought Terry Waite decided what he would ask for; he asked the guard for any book which had a picture of a particular bird on the spine. To ensure the guard knew what he meant he drew him a picture of the black and white bird he was referring to – a penguin. I loved it, a simple but incredible strong story that demonstrated the power of brands. It got me thinking how in my job as a brand consultant I often used similar stories about brands to make a point to my clients. I almost sub-consciously always tried to frame them as stories rather than just examples or case studies. Thinking consciously about it I realised that I should collecting other stories…and so I did. The notion of combining brands and storytelling is not a new one. There has been an awful lot written about it: mostly about the theory of storytelling and how you should go about doing it. Some of the work is very good and some is pretty poor. Rather than add to the theory, The Prisoner and The Penguin is dedicated to the stories themselves. This website is a companion to the forthcoming book of the same name which will be published by LID in October 2013. I believe that every brand has at least one story to tell and in The Prisoner & The Penguin there are be 76 such stories. There are the stories about some of the world’s most famous brands: Nike, Disney, Google, Coca Cola, Volkswagen and Virgin. There are stories about branding, innovation, strategy and communication and, trying (rather grandly) to follow in the tradition of Aesop, each story concludes with a short moral. I really believe that storytelling can be so much more than entertainment; it is one of the most effective educational tools in history. 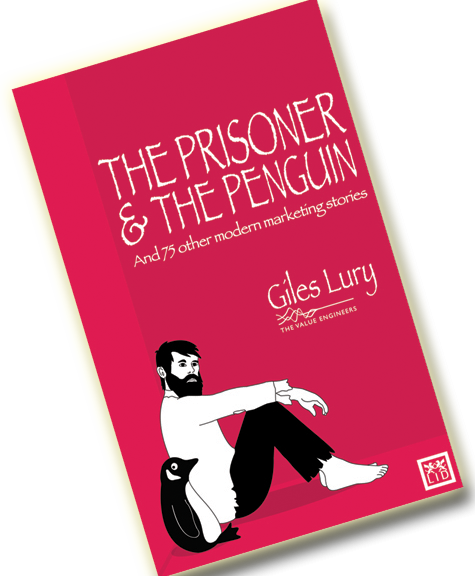 “The Prisoner and The Penguin” is on one level a grown-up storybook about brands but hopefully it can also be instructive and maybe even inspirational book for others. In this blog my aim is to share some more and different brand stories, to talk a little bit about the book – how I started collecting stories, where I get my stories from, who does my illustrations… I’m not intending to include many of the stories from the book itself, though if there is a volume two well you never know. My day job is as a partner at the strategic brand consultancy The Value Engineers and the stories I collect and write come from projects I’m working on, from clients I’m working with, books, websites, newspapers, friends and colleagues. I ‘steal’ with pride… so if you have a story you want to share please feel free to contact me. If you want to find out more about The Value Engineers please click on the link and visit our website.